The Power of Customer Misbehavior presents, in clear practitioner language, the newly discovered drivers of viral growth – product misuse, self-identity, and technological features. This information comes from academic research conducted over the past several years and has been presented at numerous conferences. Several academic papers stemming from this research are under review at top tier journals. The book The Power of Customer Misbehavior presents these newly discovered concepts as simple, actionable principles to the reader in order. 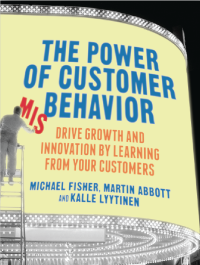 The Power of Customer Misbehavior is the first book to explore the idea that customer misuse of current features is the key to viral growth through product development based on this information. This book also introduces the concept of self identity as a motivator for participation in social networks as well as product purchases. Additionally, The Power of Customer Misbehavior discusses several technological features such as the user interface and page load time and their impact on user adoption and retention. For a primer on some of the topics that are covered in this book, read our recent article in the Graziadio Business Review and OpenView Labs. You can also read Mike Fisher’s dissertation on which this book is based.